The 2019 Spring 3-on-3 League will begin mid March and run through early June, 2019. Our Spring 3v3 league has had over 55 teams the past few years. ONLINE REGISTRATION is NOW AVAILABLE! Teams involved in our league in 2018 were from all over the South and West Metro. Teams included were: Lakeville, Prior Lake/ Savage, Bloomington, New Prague, Faribault, Apple Valley, Eagan, Burnsville, Farmington, Hastings, St. Paul and many more. This season will consist of Novice Mite through Bantam divisions. Please take a close look at the following list to find the right division for your team or player. We will take teams first. If there are any team spots left at the end, we will take individual players and pool them together to form a team. Please find a spot on a team or form your own team to guarantee yourself a spot. TEAM SPOTS WILL FILL FAST! 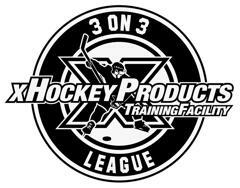 Why is xHockeyProducts Training Facility your best choice for 3 on 3? 1. Divisions and placement- We are always striving to make each division as competitive and fair as we possibly can. Spending extra time talking with coaches and teams to make sure they are in the right spot. 2. Referees and Safety – We look to hire good quality referees for all of our games to ensure your players safety and a great experience while they are at xHPTF. 4. Coaches Conduct- We do not tolerate any out of control behavior from any coaches, or parents. This includes excessive yelling, poor language, and disrespect toward referees, coaches or players. 5. Total experience – Last our goal here at xHPTF is working hard to make this a fun enjoyable experience for all parents and players involved. *Contact Ryan Kulenkamp for Novice/Mini Mite Prices. *Kids should play at the Level according to what they played this winter season, 2018 -2019.
xHPTF strongly encourages team registrations for the Spring 3-on-3 League. Please contact Ryan Kulenkamp to see if a team spot is available in your requested division, prior to registering. Once a team has been confirmed with Ryan, the coach or manager of your team will register online using the link below. *Along with your team registration please email Ryan Kulenkamp with a team name that will be used for the season and your team roster with birth years of your players. xHPTF will collect Individual Registrant information, for possible placement on a Spring 3v3 team. By registering as an individual, this does not guarantee placement onto a team, but it does provide us with the appropriate information to help in doing so. If xHPTF is able to place your son or daughter on a 3v3 team, we will be sure to get in touch with you to complete the registration process, and get you all relevant information associated with your team and division. Please click HERE for Individual Registration.